If you asked me what breeds of chickens we have, I would tell you we have a cute white one, a fat brown one and a grumpy gray one. In other words, I’m no chicken expert. And that’s why I’m the most qualified person to write this post, because I was once a beginner just like you. And if I can do it, then you definitely can. Plus, why not own a pet that your kids will love and gives back in return in so many ways (I’m talking scrambled, sunny-side up, fried and poached)? Our first batch of chickens lived in a HUGE coop in a BIG corner of our yard. It was like the Hilton for our feathered fowls. I love my chickens, but not that much. So, they were downgraded to a Motel 8 in a much smaller corner of the yard in an even smaller coop and they are doing just fine. As long as their basic needs are met, they will be happy. Locking doors and secure wiring around the coop – You don’t want you kids waking up to collect eggs only to find a coop full of dead chickens. Make sure the entire coop is secure. One raccoon will get them all. Nesting box and bedding – The chickens need a safe spot with soft pine shavings to lay their eggs. 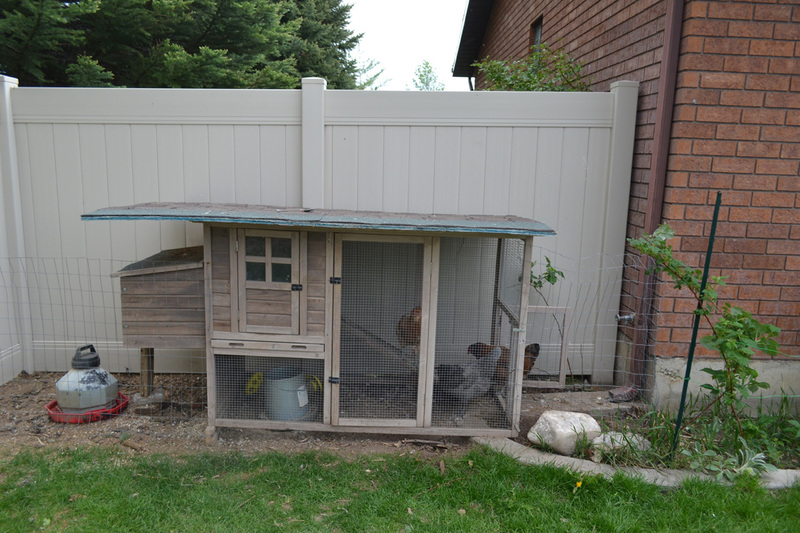 Roosting bars – We like beds; chickens like roosting bars. It’s place where they can sleep. Plus, they won’t be as susceptible to bacteria, mites and lice. 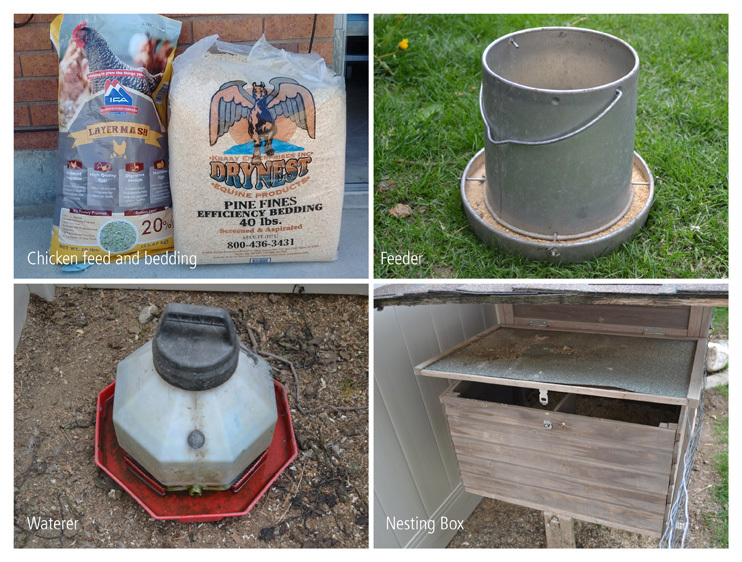 Feeder and waterer – Each of these can be purchased for about $15-20 each. Make sure to replace the chicken feed and water regularly. If not, mold can grow in the water container and mice and other rodents will be attracted to the feeder. In addition to the above supplies, you can also put chicken toys in their coop, install a motion censor light for predators and provide artificial light in the winter, but those are optional. Chickens need about 14-15 hours of light for high egg production. So we just don’t get as many eggs in the winter. 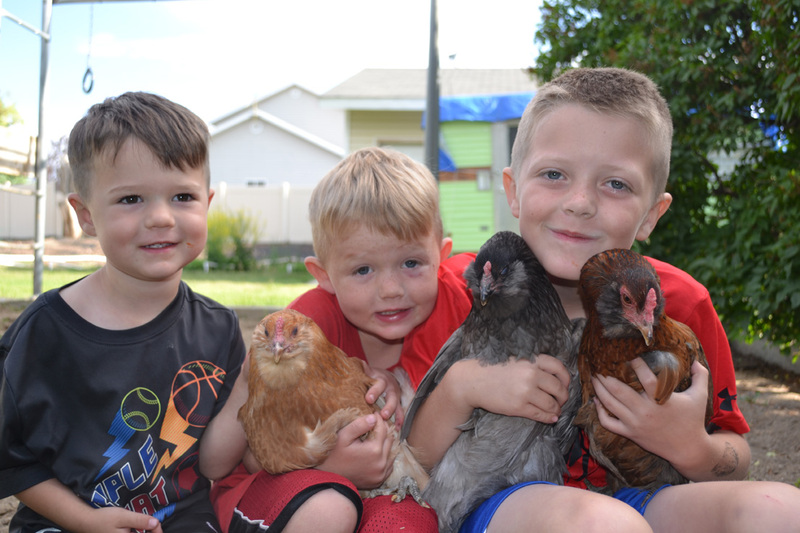 Great for kids: Aside from teaching your kids responsibility, chickens are fun to chase around and play with. Plus they can sell the extra eggs for a little bit of spending money. Inexpensive: We have three chickens that lay one egg a day. That’s 84 eggs a month. If I bought that many eggs at the store every month, that would cost me more than $20! So, you’re actually coming out on top thanks to these cluckers. 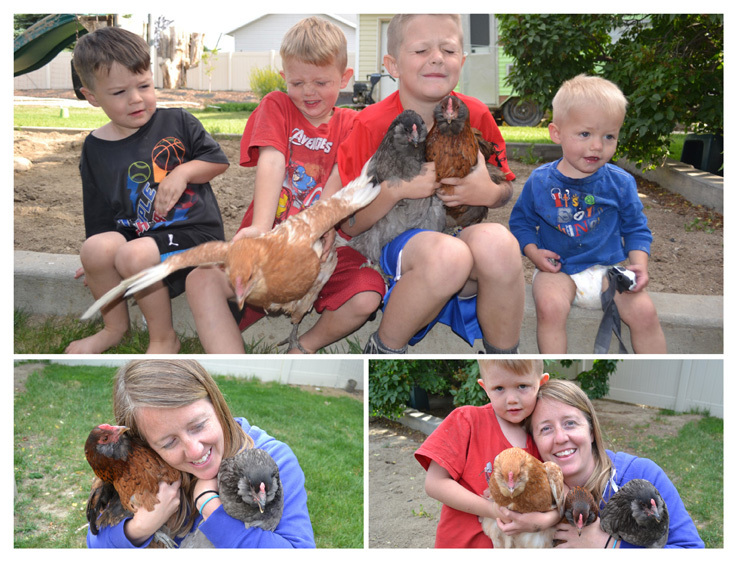 Weed maintenance/fertilizer: From about March to October, we let out chickens roam the backyard. They are great at eating weeds and fertilizing our lawn and garden. If you’re considering raising your chickens from chicks, there’s a lot of helpful information at this website. If you want to learn more about the different type of chicken breeds, click here. 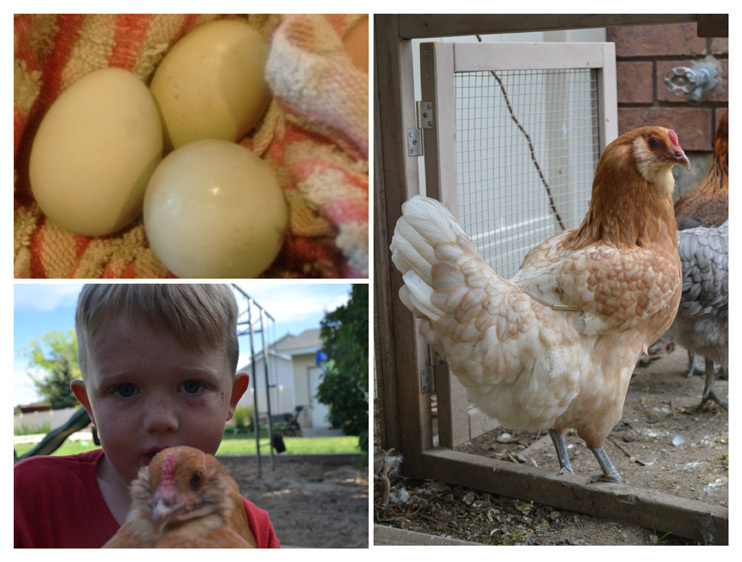 And finally, once you’ve got some good egg production, click here for some yummy recipes.